So no geology this post, but instead I thought I'd post some of the wildlife pictures I took on the Denali and Kenai Peninsula field trips. 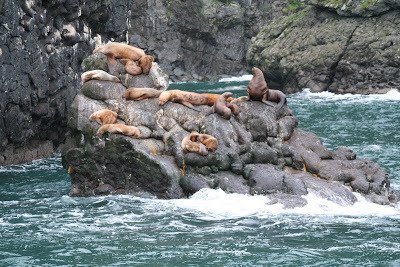 First from the Kenai peninsula fjords cruise, some Stellar Sea Lions, hanging out on pillow basalts. I guess I lied, I said no geology, and here I am tossing around the term pillow basalts. This species is endangered, and if you look at the guy in the center, you can see he has a numbered brand. The decline in sea lion population is a little confusing, allegedly, and the tatoos help track them throughout their range. The pillow basalts, while not endangered, are still fantastic. This cruise actually included some of the best pillow basalt exposures I've ever seen firsthand. Next up, a black bear! To attempt to head off any scolding comments or emails, I did not approach this bear. I was walking down a path when I came on a student who had stopped. She had been there for a few seconds. 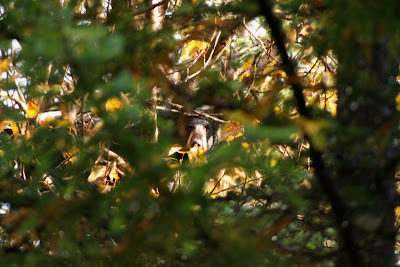 She had walked around a corner, and a youngish black bear had seen her and ran into a tree. I had my camera out, snapped this picture, and quietly walked away, trying not to attract anyone else down the walkway. What would Alaska be without a moose? What this picture doesn't show is the other 50 people on the side of the road snapping pictures of this moose. I took this last picture for my Mom, just to say that we did not see any of the famous Alaskan "chikens" on the trip. Oooh, neat sea lions. Resting on pillows - I like it! Great Pics! Thanks for sharing and describing what the Stellar Sea Lions are laying on. I find geology fascinating and really enjoy your blog. Your Aunt Kathy would have loved the "chiken," too. 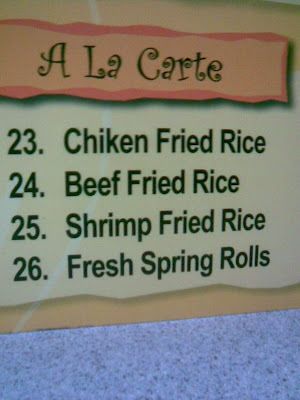 We always enjoyed unique menu offerings. I love your images! They make me wish I stuck with the idea of being an animal behavior biologist. I'm glad your blog became a 'blog of note' b/c that's how I found it. Thanks for sharing your images and I hope you keep doing so! How do you get your blog to cover the entire width of the screen? Waaw, you make amazing images of these extraordinary animals. We moved 4 years ago from Europe to Canada and we absolutely love the wildlife here. 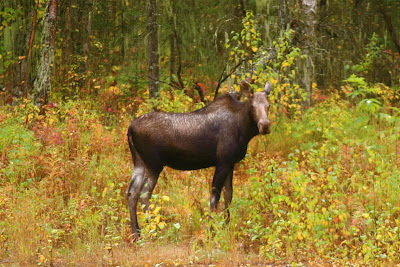 I haven't seen any of these animals in real life... well I did see a moose 2 years ago with a binocular when we were visiting the Algonquin park but it was so far away and so well camouflaged that I nearly missed it. And a bear, not that I really look forward meeting one on my way, we haven't seen either, but we have walked trails where we saw a note telling visitors about a bear walking around. Oh,.... I guess the closest we can get to these amazing animals will be the Zoo I guess but I would prefer to see them in their natural habitat. I'm a tat jealous of you that you had this experience. Enjoy the rest of your trips! I've featured this blog on my own. I really hope you keep this project up; it's wonderful. hello, I was just browsing around and I stumbled upon your blog. I just want to say that it was very nice, I myself love nature but living in New York... it's not so easy to see, unless you drive for three hours. Your pictures were very nice. Blog of Note! Yeah! Congrats!! I am glad to see the pictures you posted. Now I could imagine "Denali and Kenai Peninsula" with sea lions. Thanks for making the pictures available specially to us who are mostly glued into our workplaces. Reached here from a friend's blog and glad I did. The first picture of the sea-lions looks more like that of babies lying on rocks. Other pics're simply stunning, amazing and so so so wonderful. Alaska is on my travel list, hope i will make there in the next decade or so. But I m sure I would travel throught your blog to the destination. As a one time Alaskan...I LOVED the pictures. Definitely miss the moose and the "No Puffin" signs everywhere. Hi! While I am no geologist, I appreciate the hard work this particular branch of science requires. Plus you get to see some fantastic images. Despite my lack of knowledge of the subject, your writing is quite engaging and enjoyable. I like the Moose picture. I agree where would we be with out the moose. The MENU caught my attention. Never thought such Asian fares actually do exist way across the world in Alaska! Great site! I hope you wouldn't mind. I am reading on some interesting sites like Japan and Alaska. I googled Alaska and your blog came in number 1! Have a cool and great day ahead of you!